Mission survey area off northwest Catalina Island. Image courtesy of Boeing. Download larger version (jpg, 327 KB). 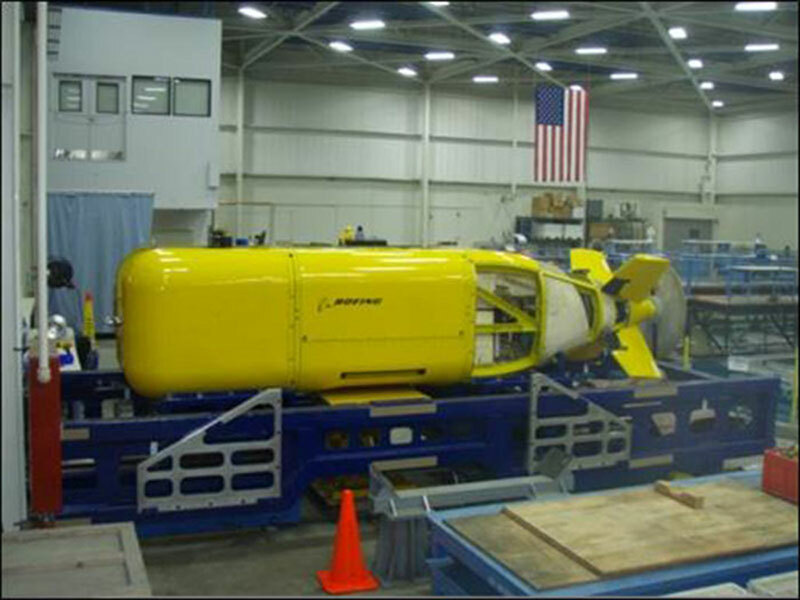 NOAA’s National Marine Fisheries Service Southwest Fisheries Science Center is working with Boeing under a Cooperative Research and Development Agreement to explore the potential applicability of the large autonomous underwater vehicle (AUV) Echo Ranger for a rockfish survey. Rockfishes and their close relatives are some of the most important fishes on the Pacific Coast as they are favorites of recreational and commercial fishers and have significant economic value. Rocky habitat provides a challenge for traditional ship-based acoustic survey methods as resolving fish living near and within uneven bottom is difficult. NOAA is interested in trying new platform and sensor technologies to identify fish and characterize their habitat to improve fisheries abundance estimates. Echo Ranger AUV in the lab. Image courtesy of Boeing. Download image (jpg, 81 KB). The mission will take place off Catalina Island in southern California and will generate acoustic maps (high-resolution bathymetry and seabed backscatter) of rockfish habitat. The AUV will acquire acoustic/sonar information about individual rockfish and aggregations of fish. The AUV will also collect three-dimensional optical imagery using stereo camera systems to identify and measure fish detected by the acoustic data. The project will emulate the methods currently used by the Advanced Survey Technologies Group at the Southwest Fisheries Science Center to conduct acoustic-optical surveys of rockfish in southern California using hull-mounted sonars and a remotely operated vehicle and evaluate an AUV’s ability either to conduct these surveys independently or to augment a ship-based rockfish survey. The Echo Ranger AUV is a unique platform. This large displacement vehicle allows increased payload for sensors and batteries with longer mission endurance. NOAA’s Office of Ocean Exploration and Research led the development of NOAA’s agreement with Boeing to investigate new data collection methodologies using such innovative platforms to meet NOAA mission requirements. Schematic of the Echo Ranger AUV. Image courtesy of Boeing. Image courtesy of Boeing. Download larger version (jpg, 142 KB).